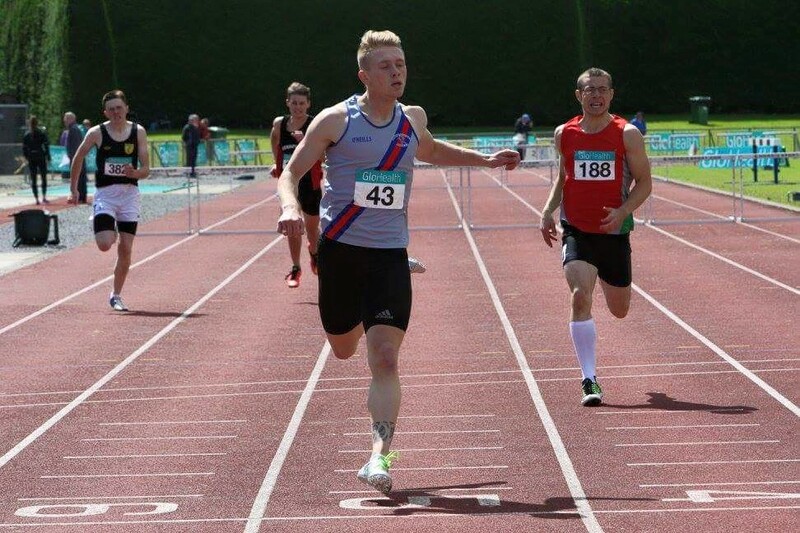 Joe Halwax took the Junior 400m hurdles title at the National Junior and U.23 Championship in a wet and windy Tullamore on Saturday. Mollie O’Reilly finished 2nd in the Junior Women’s 400m and her team mate Rachel Dunne had a fast finish in the Junior 100m hurdles to also take silver, with Meghan Ryan 2nd in the U.23 5,000m. Mollie and Rachel were joined by Katie Magee and our very versatile Sophie Murphy to win the 4x100m title. Sophie was 3rd in her own distance, 1500m with Abi Taylor, who makes this age group for three more years, finishing 4 th. James Holden finished 4th in the 400m and he qualifies for this age group for two more years. Gold for Siofra and Sinead in Santry! The good times kept rolling on Sunday in Santry, after our two golds and a bronze on Saturday, D.S.D., added three more golds and a bronze. One of the gutsiest displays ever by a D.S.D. athlete was given by Sinead Denny, who had a ferocious battle with Phil Healy, all the way throughout the one lap race, and won with a glorious dip on the line to cement her place for the European Championships. This was a race totally dominated by D.S.D. athletes as we had four in the final, Sinead, Lauren Hansson, Gabrielle Coveney and Mollie O’Reilly. Mollie, only 17 years, ran a huge PB of 55.01 for 5th place and a World Junior Q.T. Later on Lauren, Gabrielle and Mollie were joined by Rachel Dunne to romp away with the 4x400m. One of the greatest comebacks of all time saw David Gillick finish a close 3rd in the 400m after three years out of competition, in 46.44. David lived up to the old adage “form is temporary – class is permanent”, as he ensured the Irish 4x400m team for Europeans and Rio will be a formidable unit, as the first four over the line all went sub 47. Siofra Cleirigh Buttner had the most dominant display of the day to win the 800m in a fast championships time of 2.04.72, having to lead from gun to tape on her own, to win by a 6 seconds margin. Mark Kavanagh returned to action in the 100m with a great 4th place after injury stopped his progress. Amazingly Zac Curran ran a PB of 46.99, but had to settle for a 6th place finish in a top class 400m event. Just off the medals also were Joe Halwax 400m hurdles 54.21 (PB); Grainne Moggan and Grace O’Rourke joint 4th High Jump. Mark Conway was delighted to reach the final of the 1,500m with a PB of 3.55.95; Tara Jenkins was 6th in the Long Jump 5.12; and also making the finals were Megan Ryan and Fiona Clinton 5,000m; Katie Berney 200m and Rachel Dunne 400m hurdles. D.S.D., ended up top team at the championships with five gold and two bronze medals. It should also be noted that this is a very young team, which augurs well for the future. All in all, a glorious occasion for the club. Laura Shaughnessy finished 1st in the Dunshaughlin 10k on Sunday in 35.40, with Niamh Devlin in 5th place. Annette Kehoe won the W50 in 43.30, with Maxine Jones also 1st in the W.60 in 44.00. In the men’s race Brandon Hargreaves was just pipped on the line for 1st, finishing 2nd in 29.44. Siofra Cleirigh Buttner set a great new PB in Princeton, New Jersey at the weekend, when winning the 800m in 2.02.37, which was inside the European “B” Qualification of 2.02.90. Also in action at the weekend was Sinead Denny, who won the 400m at the Brussels Grand Prix in 53.44, not far off her recent PB. Lauren Hansson finished 5th in 55.21. D.S.D., women's team put up a great performance today in Leiria, Portugal, finishing in third place to win the bronze medals. Our ever reliable Maria McCambridge won the 1500m in 4.31.86, comfortably clear of Amanda Virtanan of Finland. Grace O'Rourke gave D.S.D the perfect start of the day when she won the high jump with a leap of 1.70. More great results were to follow with Anita White winning the javelin with a throw of 49.79; Laura Shaughnessy won the steeple chase with a time of 11.13.02. Also in first place was Fiona Clinton in the 5,000m in 17.12.2. One of the classiest performances for D.S.D was by Sinead Denny who finihed 2nd in a PB of 53.63 and she also ran a great leg on the 4x400 relay team for a 2nd place finish in 3.42.17. Meghan Ryan was in top form also finishing 2nd in the 3,000m 10.07.66. A feature of D.S.D. 's performance were the results of our juniors who contributed enormously to the overall score. Mollie; Rachel and Katie Magee ran superb legs in the 4x400m to combine with Sinead for a great 2nd place. This was one of the best wins, at team level, for a long time for D.S.D., and was reminiscent of our National Cross-Country Four Team wins a few years ago. Brandon Hargreaves, who just returned from sabbatical in the U.S., was always in the lead group and finished in 3rd place. Joe Sweeney (5th) showed he is returning to the form that saw him finish 5th in the European C.C. Championships, with Killian Mooney, the youngest of the top finishers, in 10th place and Mark Conway will be remembered as the 4thscorer on this momentous occasion. This week DSD has arranged to have a sports masseuse in Marlay Park on Thursday for members who wish to get a 15 minute massage. Sessions will take place in the changing room beside the Tennis Courts. This scheme is aimed at athletes who are struggling with tight or stiff muscles or a niggle that they are aware of, it is not a spa treatment!!!! Hard luck to Siofra Cleirigh Buttner, who just missed reaching the American Collegiate final, by a few hundreds of a second, as she finished a close 4th in her heat in 2.04.77. Another very good run by Siofra! Anita White continued her relentless pursuit of the qualifying standard for the Javelin when she competed in Romania at the weekend. Anita finished 11th with an improved throw of 51.43. Well done Anita! Congratulations to Anita White, who started off her season in great style, when finishing 2nd in a Javelin Competition in Zurich at the weekend. Anita threw 50.83 and is hoping to extend this further in her next competition in Romania in just over a week’s time, where she is aiming for the 57.50 qualification throw required for the European Championships. Best of luck Anita! Star of the show at the AAI National Indoor Championships, at the weekend in Athlone, was Sinead Denny, who won gold in the 400m with a great new PB of 53.57. Considering that our weather has been all against preparation for Indoors, this was a remarkable performance and well worth all those hard winter training days and the tough sessions on the hills at Ticknock. Sinead blasted out of the blocks and never saw another opponent as she maintained a fast rhythm to the finish line. Mollie O’Reilly was the youngest finalist, registering a PB in the heats on Saturday of 56.49 and improving on this time again in the final to finish 5th in 56.32 (PB). In the women’s High Jump D.S.D., were again to the fore as it became a three way jump off for the medals, with Grainne Moggan winning silver (1.70) and Grace O’Rourke bronze also with a 1.70 leap. The club is making great progress in this event, as we won many medals in the juvenile Dublin Championships and the legacy of Deirdre Ryan should be safe in the hands of these fine young athletes. Jerome Caprice continued to collect medals in the 3,000m walk as he collected bronze, against top class opposition. Well done also to Rick Nally 1,500m; Aengus Meldon 800m, and Rachel Dunne 100m hurdles, who all performed well. Women just pipped for 1st in Novice! Well done to our Novice Women’s Team on finishing 2nd in Dungarvan on Sunday in the National Novice Cross Country Championships, led home by Clare McCarthy 5th, and Hariette Robinson 6th; (same time); with Stephanie Barnwell 24th and Soracha Humphreys 54th. The girls were only beaten by two points by Youghal A.C. In the Men’s Novice Leon O’Connor finished 21st; with Mark Conway 66th; Diarmuid Meldon 80th; Michael McCarthy 132nd and Garrett Banahan 138th.